Born and raised in El Paso, Texas, Dr. Roberto Fournier, O.D. completed his undergraduate training at the University of Texas at Austin where he earned his Bachelor’s of Science degree in Neurobiology with high distinction. 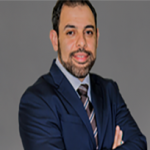 He continued his education at UIW Rosenberg School of Optometry in San Antonio, where he completed his fourth year externship training at Daytona Beach VA Outpatient Clinic and Community Eye Clinic in Fort Worth, Texas with a strong background in ocular disease and post-operative care. 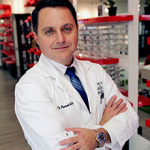 He successfully received his Doctorate of Optometry degree in 2017, and is a proud member of the American Optometric Association and the Texas Optometric Association. Dr. Fournier is passionate about fitness and maintaining a balanced lifestyle. He enjoys hiking, traveling, and creating adventure. He is proud and excited to serve the community he grew up in! To Schedule An Appointment With Dr. Fournier Or Any Of Our Doctors Call 915-261-7011.